With device management in Azure Active Directory (Azure AD), you can ensure that your users are accessing your resources from devices that meet your standards for security and compliance. 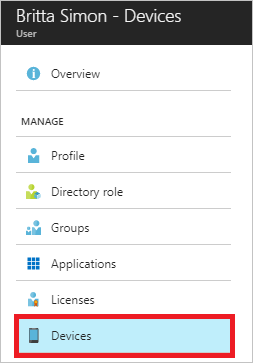 Sign in to the Azure portal as administrator. On the left navbar, click Active Directory. 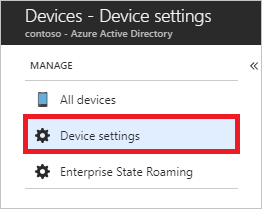 Users may join devices to Azure AD - This setting enables you to select the users who can join devices to Azure AD. The default is All. This setting is only applicable to Azure AD Join on Windows 10. 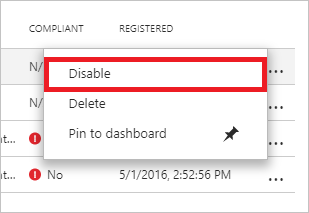 Users may register their devices with Azure AD - You need to configure this setting to allow devices to be registered with Azure AD. If you select None, devices are not allowed to register when they are not Azure AD joined or hybrid Azure AD joined. Enrollment with Microsoft Intune or Mobile Device Management (MDM) for Office 365 requires registration. If you have configured either of these services, ALL is selected and NONE is not available. 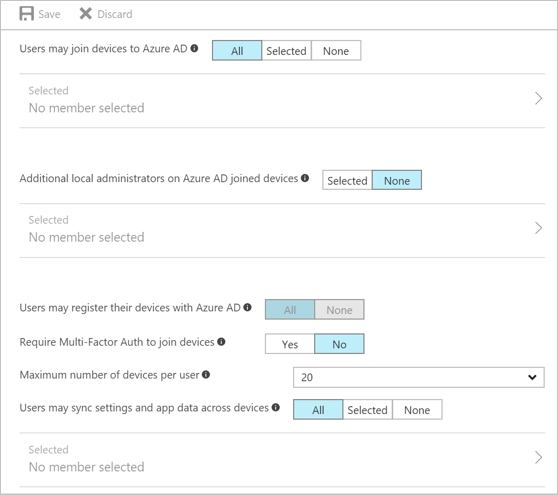 Require Multi-Factor Auth to join devices - You can choose whether users are required to provide a second authentication factor to join their device to Azure AD. The default is No. We recommend requiring multi-factor authentication when registering a device. Before you enable multi-factor authentication for this service, you must ensure that multi-factor authentication is configured for the users that register their devices. For more information on different Azure multi-factor authentication services, see getting started with Azure multi-factor authentication. This setting does not impact hybrid join for Windows 10 or Windows 7. This is only applicable to Azure AD Join on Windows 10 and BYO device registration for Windows 10, iOS, and Android. 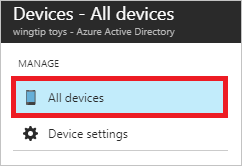 Maximum number of devices - This setting enables you to select the maximum number of devices that a user can have in Azure AD. If a user reaches this quota, they are not be able to add additional devices until one or more of the existing devices are removed. The device quote is counted for all devices that are either Azure AD joined or Azure AD registered today. The default value is 20. Users may sync settings and app data across devices - By default, this setting is set to NONE. Selecting specific users or groups or ALL allows the user’s settings and app data to sync across their Windows 10 devices. Learn more on how sync works in Windows 10. This option is a premium capability available through products such as Azure AD Premium or the Enterprise Mobility Suite (EMS). Enables you to search for devices using the display name as filter. For some iOS devices, the device names containing apostrophes can potentially use different characters that look like apostrophes. So searching for such devices is a little tricky - if you are not seeing search results correctly, please ensure that the search string contains matching apostrophe character. This section provides you with information about common device management tasks. If you are an Intune administrator, you can manage devices marked as Microsoft Intune. You need to be a global administrator or cloud device administrator in Azure AD to enable / disable a device. Disabling a device prevents a device from successfully authenticating with Azure AD, thereby preventing the device from accessing your Azure AD resources that are guarded by device CA or using your WH4B credentials. 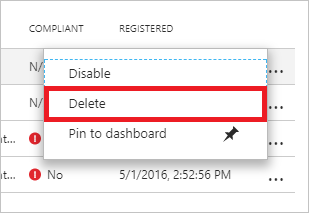 You need to be a global administrator or an Intune administrator in Azure AD to delete a device. Prevents a device from accessing your Azure AD resources. Removes all details that are attached to the device, for example, BitLocker keys for Windows devices. Represents a non-recoverable activity and is not recommended unless it is required. 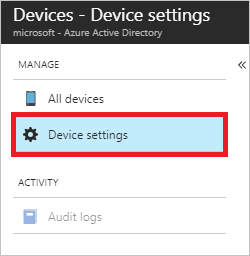 If a device is managed by another management authority (for example, Microsoft Intune), please make sure that the device has been wiped / retired before deleting the device in Azure AD. You can use a device ID to verify the device ID details on the device or using PowerShell during troubleshooting. To access the copy option, click the device. You can view and copy the BitLocker keys to help users to recover their encrypted drive. These keys are only available for Windows devices that are encrypted and have their keys stored in Azure AD. You can copy these keys when accessing details of the device. Hybrid Azure AD Joined Windows 10 devices do not have an owner. So, if you are looking for a device by owner and didn't find it, search by the device ID. 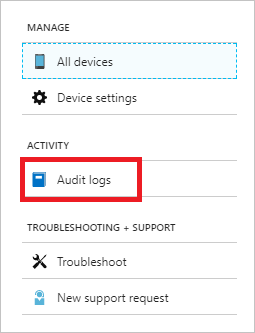 Your entry point to the auditing data is Audit logs in the Activity section of the Devices page. In addition to the filters, you can search for specific entries.